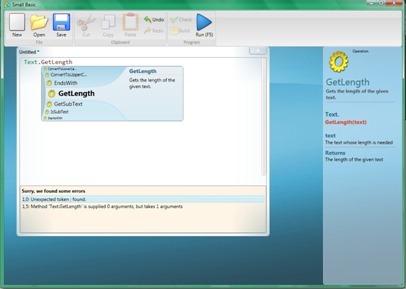 Teach Kids Programming with Small Basic from Microsoft! I came across this on ReadWriteWeb, and since I was planning on teaching my 11 year old brother how to program, this is a God sent! Small Basic is actually a “new” version of BASIC language with just 14 keywords and based on .NET 3.5. Small Basic has its very own cute little IDE. Ranging from graphics, sounds, arrays, stacks, network access, and Flickr photo access, it seems to be just the perfect way for anyone to get started with programming. It also has IntelliSense built in, along with a very helpful debugger. This is like a free little Visual Studio for kids. There’s also a very easy and helpful guide available for Small Basic to get your kid started.